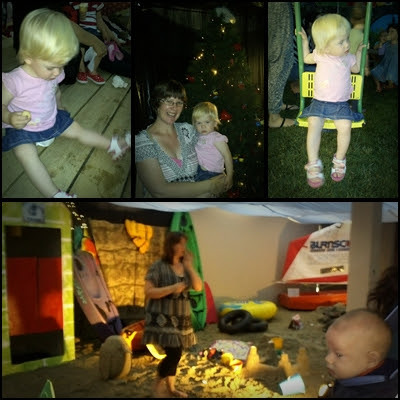 Despite my previous post - there has been a few highlights in the build-up to this Christmas, so I thought I would share a few here to remind myself it really is NOT all that bad :-)! Button and I went on our first ever Playcentre trip the other week - we went through a local 'Kiwiana Christmas Walk Through'... these photos really don't do it any justice whatsoever! It was amazing, and I wish I could have had a decent camera and got photos worthy of it to share with you; but maybe next year?!? 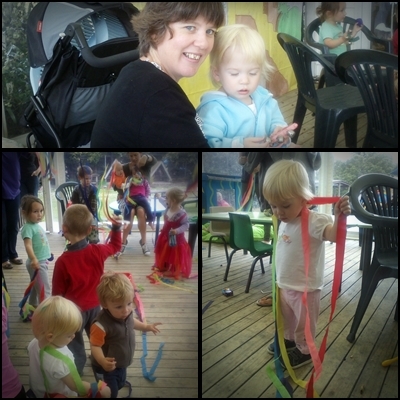 Playcentre again - these were taken in our last week... there was a 'Christmas Carol Sing-A-Long' during one of our sessions, and the musical instruments were brought out, as well as streamers! It was SO much fun, and even Button stayed on my knee and enjoyed it - it is pretty much the only time I have actually sung Christmas Carols this year, how sad is that! Top Left = the dress we bought Button for Christmas Day! Just the cutest little dress for the cutest wee toddler... LOVE that smile, LOVE that girl! 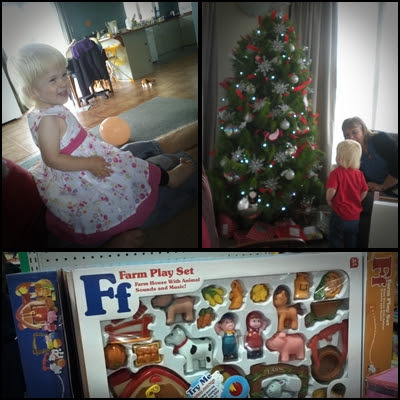 Top Right = Button and Nana admiring Aunty Shar's Christmas Tree the other day! Oh my gosh, walking into that house brought back so many Christmas memories with the smell of a real tree... almost brought that Christmas Spirit bubbling instantly back up to the surface! Bottom = One of Button's Christmas presents from us... oh how we love K-Mart! She is going to LOVE this, and yet it was only $25; the only problem with K-Mart is that SO many other people love it and their prices also, that you have to buy it instantly or miss out! I learnt that the hard way... so when Mr.C came home and showed me this, we went back down to the shops that afternoon so we could purchase it!!!! 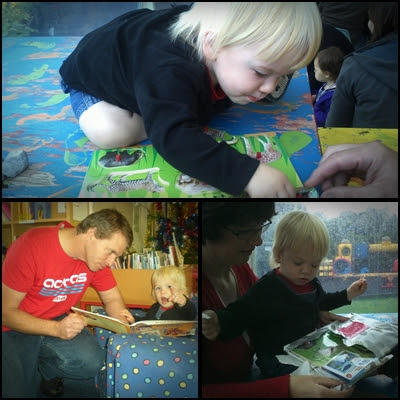 Playcentre Christmas Party - Button and I were very excited that Mr.C was able to take a couple of hours off work and join us there. However the weather wasn't so grateful and bucketed down the entire time :-(! Button LOVED having her Daddy there, and basically had as little to do with me as she has ever had before... was so nice to get a break (she can still be a bit of a cling-on)!!!! She loved the present 'Santa' gave her, but HATED Santa himself *grin*... and I love the fact I can still buy her Christmas presents in front of her and she hasn't the faintest idea - last year though, got to get more organised next year! And finally - 'the house' Christmas Breakfast! For those of you who have actually been here, or who have been following my blog for a LONG while... will know we share a LARGE house with a lot of other people! Our part is totally self-contained, and we can chose how much we see (or don't see *grin*) of the neighbours - we LOVE it here! Like last year, we celebrated Christmas as a group, buying just for the kids... the difference was that we did a breakfast this year, opposed to a dinner last year. SO much better, I highly recommend it - suits the kids heaps more (despite the 4:15am start that Button had given us that morning *sigh*). 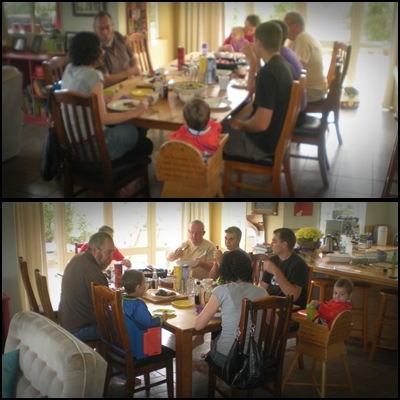 There was a lot of fun, a lot of food and a very relaxed atmosphere... will do it again peoples! So really - it hasn't been totally void of festivities this year after all... and Button has enjoyed everything we have managed to fit in. But Christmas Day will be the highlight, as she is going to be one spoiled wee girl this year :-)! Enjoy it while you can I say - next Christmas she'll have a baby brother to share the day with; this is her last year as 'an only child'!!!! Oh Yes, I did forget you have a baby on the way. The pictures are wonderful. Here is a post idea. Do an interview with Grandma and Button. What would a conversation be like between just the two of them. Of course include pictures of the two of them. Or you could do just daddy and her, or auntie and button. Just an idea. Might be fun to see how Button would answer and ask questions? Happy Christmas from Amy in the USA, Florida. Your perspective on Christmas is always changing... just enjoy each one as it comes.